This is the largest of our apartments having two bedrooms sleeping 4 to 5 people. The main bedroom is also equipped with an air conditioning unit. The spare bedroom, lounge area and kitchen/dining all have ceiling fans. The apartment also has two bathrooms (shower, toilet and sink facilities). A desk is also located in the short corridor area. Entrance to this apartment is down the short stairway alongside the koi fish pond, and opposite the vine tree gazebo. 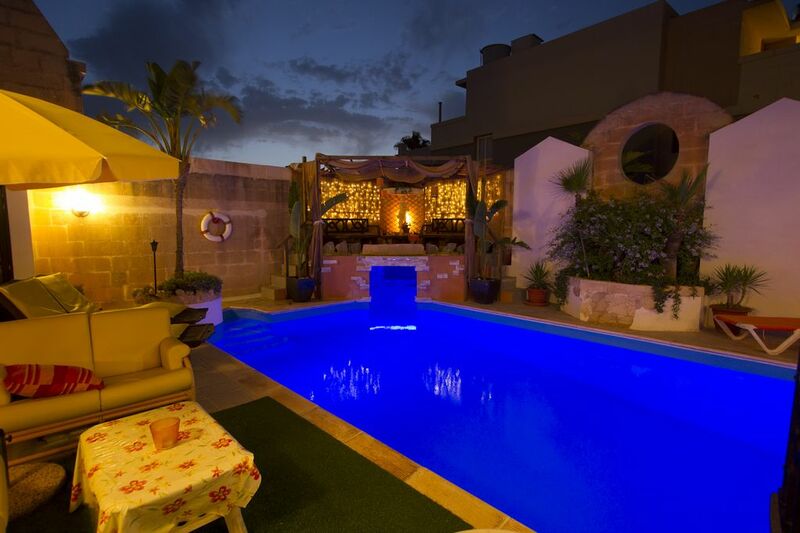 A choice of 3 tranquil villa apartments with all amenities in this exclusive part of Malta. Quiet and peaceful yet only minutes away from the entertainment hub of Paceville and the more popular St. Julians Bay with its many restaurants and great bars. Properties also enjoys the use of a large swimming pool (41 sq m), sunbeds, deckchairs, hammock for a couple, 3 seater hammock swing, rocking bench, large umbrellas, gazebo seating for 8, barbecue area with its own fridge and kitchen facilities, shower and WC facilities by pool area. The deck area has been extended making more space for our guests; this was also upgraded with exclusive floor/wall lights, new tiling, new deck area furniture and more trees for a true tropical feeling. The pool area and most of the deck area will be covered by a retractable cover; the pool will be heated and the area has been upgraded to host an exclusive experience even for our autumn/winter guests. Access to pool area is via wooden bridge over large cascading koy fish pond. A further gazebo with vine tree is adjacent to a smaller water turtle pond. Very romantic setting in this hilltop area with extensive views of Malta, where the tropical garden and the cascading waters from the fish ponds continue to add to the serenity that the whole place seems to create. Our pets: Our garden, although small, is very mature and extremely well kept, providing a tranquil atmosphere, also helped by the sound of the cascading waters in the background. Our own pets, (cats and dog), other than the koy fish and turtles already mentioned, also have their own separate dens, and are well kept, pampered and cared for. For those who want more out of their holiday: The pool and garden areas have proven to be a refreshing start or close to any day, particularly if this was a warm or even a blistering one. But Malta has much more to offer than just lazing about in the sun. For this reason we have teamed up with some of the most interesting tour, leisure and event operators on the island, providing day cruises around the Maltese archipelago on a Turkish gullet, an evening’s entertainment extravaganza live show on the 1565 Great Siege of Malta, a visit to the nearby water marine park, an unforgettable once-in-a-lifetime experience swim with the dolphins, or how about exploring some of the most interesting dive sites in the Mediterranean. In collaboration with our friends at Go Dive Malta, we are now also able to offer this experience to practically everyone, from beginners to dive masters. Transport arrangements have also been secured for all these events to pick our guests from our apartments (or very close by). What we stand for. : We have been called ‘a home away from home’ by some of our past guests, a name which honours us completely, and while we continue to dispense recommendations on what to do and where to go during your stay to help you better discover these culture-packed islands, we will strive to live up to that name and better our product. Having worked for some of the most prestigious travel and holiday companies in our teen years, helps us better understand what tourists are looking for; we have now been in the business of renting properties to tourists for a number of years, delivering a friendly service and a knowledgeable based background to anything local. We built the property ourselves and so put everything into it, not only for our guests, but also made the upstairs area our own living quarters. We are an easy-going family of 3, and unless you need our attention, assistance or advise, you will probably never see us. The pool area has always been impressive and had guests endlessly falling in love with it; this has furthered our determination to make it even better, year in year out, but now we've gone a bit too far, actually over the top. The pool area will soon receive its retractable cover which will enclose not only the pool area but also most of the deck area as well, meaning that in autumn and winter this place and the pool water are heated, making it in an oasis within itself. We believe the pool area will be unmatched and even if the investment has been extraordinary, we feel it's been worth it as this place will be transformed into a haven. Come rain or shine, any time of year, our guests will still be able to enjoy not only a swim or leisure time in the grotto jacuzzi, but also partaking in the peaceful atmosphere this area will continue to convey and exude whether it's just relaxing on a deckchair or the garden settees, or reading a book, with only the lapping of the soft water to disturb the quiet in this tropical environment. As of Autumn, the pool and most of the deck area will be covered by a retractable cover; pool will also have heat pump to ensure that this can be used all year round, whatever the weather conditions. As of Autumn, the pool and most of the deck area will be covered by a retractable cover; pool will also have heat pump to ensure that this can be used all year round, whatever the weather conditions. We are now also pleased to inform all our guests that the new jacuzzi installation is complete and running. The idea behind this was to replace our 4 seater open Jacuzzi with one that actually holds 9 people; this walk-in construction also takes the shape of a cave rather than having to leave the pool to get to the Jacuzzi bringing a whole new meaning to luxury. The pictures were taken during the night to add to the affect of the new lighting fixtures in the harem chill-out seating area. There is also a water rainfall to the entrance of the jacuzzi to add to the tropical ambiance and feel of this vibrant place. In essence, the pool has been installed with a new liner; we have also replaced the lights in the pool with LED lighting. The inside of the jacuzzi is constantly painted in a soft blue light, which is accentuated by the silver coloured tiling inside as this reflects off it during the night, perfectly complimenting eachother. The seating above the jacuzzi has been a real surprise as it turned out to be even better than what we had ever imagined it to be. Here we have placed garden furniture blending in perfectly to the setting. The frame to this area is fabricated out of wood giving it that harem feeling as you climb up the stairs and lounge in what is already a favourite area of many of our guests. At the same time, we have also replaced our chlorination system to one that is more green, as this not only eliminates the taste of chlorine but makes the water that much clearer, making it even more enticingly exciting. Equipped with a dedicated solar heating system which has almost guaranteed the use of the pool and outside jacuzzi from early April to late October (depending on whether the weather is kind to us). Both the kitchen/dining and lounge areas are each equipped with large ceiling fans. There are various garden fixtures and furniture where one can lounge and rest. The gazebo overlooking the pool has seating for at least 8 people, a rocking bench for 3, a 3 seater hammock swing, a rope hammock for a couple, deckchairs, breakfast area by the pool with seating for at least 5, and other sundry miscellaneous items. The pool area also has its own toilet/shower facilities. The barbeque is also equipped with its own fridge thus one can easily find his cool drinks without having to go the apartment every time. In addition, the barbecue area is also equipped with a kitchenette. The smaller vine tree gazebo, with the turtle pond to the back and adjacent to the fish pond, also provides seating for another 4 persons. Close to this is another wrought iron table with seating for 4. Une propriété située sur les hauteurs de Malte dans un quartier résidentiel très calme. Les extérieurs sont enchanteurs et agencés avec bon goût. Le pourtour de la piscine est magnifique de jour comme de nuit. Quel plaisir de s'y baigner ou bien d'y déjeuner ou diner. Le lieu de vie et de couchage est fonctionnel mais manque de lumière naturelle par manque d'ouverture. Les propriétaires sont accueillants, gentils et serviables. Endroit à recommander en famille. The whole property is very pleasant and we enjoyed sunbathing and chilling around the swimming pool and the BBQ. Paul and Josanne are great hosts, they took care of us in such a nice way. The house is a bit far from Paceville and Sant Julian, but accessible by bus. We were booked in for two weeks this month - October 2015. Prior to booking Paul was superbly helpful and as a result we really had very high expectations of the accommodation. We were really quite horrified at what we found. The apartment is in fact in the basement with one tiny window. The inside was very musty, one of our party, an asthmatic, felt her chest tightening due to the presence of mould spores in the air, the living area was cramped with poor quality seating and the cooker was rusty. That was the bit that most offended me. Why insult visitors with a cooker that has been badly painted to hide the rust? The top of it was also dirty with bits of food stuck on it which I was picking off with my nails. The flat entrance is below the level of the fish and turtle ponds. The smell that came down into the doorway - the only way in or out - was just horrid. Paul was thoroughly decent and offered us an Immediate and full refund which we accepted and also allowed us to use his internet at no cost to find alternative accommodation. We cannot fault Paul in how he dealt with us but a bit of me is quite angry that we almost flew home on the day we arrived because of the poor and unacceptable standard of accommodation. These guests missed their evening flight and it was only after our driver had been dispatched that we got to know. We made arrangements to again send our driver the next day to meet them and also arranged to postpone their car hire so as not to be charged for the extra day, making an exception for the car delivery to Yellow even on a Sunday. I do not only provide a product but also a service and yet the review is solely based on the apartment without considering the other facilities at this complex or the services received. While the guest acknowledges the latter, I am confused as to why the review is then regaled with 1 star. Despite the many pluses, the guest preferred to concentrate on the one thing she decided to admonish. Admittedly, Yellow is not 5 star; I have never said it was, but many others before you have all enjoyed their stay with us. I do not expect everyone to like what I offer and assumed that the photos on the website, the description, and previous reviews would certainly best describe Yellow. The contentment of our guests has always been my prime goal, even if this may mean having to sometimes lose business (my integrity goes well beyond my financial expectations); on hearing that you were not happy, I unreservedly offered you assistance (wifi to look for another place, taxi to take you there, also helping yourselves to the complimentary food pack, etc.) + a full refund of your payment. I don’t expect guests to glorify the apartment, but then neither do I expect for someone who I treated with dignity to write the worst review I have ever received. Please allow me to put things into perspective; on arrival you immediately informed us that you now decided you did NOT want the car hire; you also said that you would now prefer to stay in Gozo instead of Malta, mainly because it was more rural. You also apologized, profusely, for the constant change of mind, and this saddens me, not only because you failed to appreciate the kindness offered you, but also because it seemed to me that you had made other plans during the complimentary ride over from the airport. To your queries, Yellow was not only cleaned but also white washed in the 3 vacant days before your arrival; sofas are only 2 years old so I totally disagree with poor quality description; cooker was replaced the next day as planned; pond is equipped with 2 pumps, filter and UV filtration so I really can't understand what odour you refer to. Please be guided by correctness! We thoroughly enjoyed our stay at these fabulous apartments. Paul and Josanne are just the best! From the moment we booked our stay, communication was brilliant - all questions answered with a very friendly manner. As I already knew they island, I was particularly interested in staying in Madliena as it is wonderfully peaceful and away from the real hustle and bustle. Nathaniel (Paul and Josanne's son) picked us up at the airport (exactly where I was told he would be - amazing!) and drove us to the apartment, happily taking a small detour so I could show my daughter my old flat! As it was evening, he also took us to the supermarket so we could stock up on essentials. Paul and Josanne were so helpful. We rented a car - not just because the apartment is up a hill (and I am lazy!) but because the best bits of the island are off the beaten track. Josanne put me in touch with a rental company who were also really accommodating, even letting me change drop off times and places at the last minute. Fab car as well! When the weather turned slightly cold, Paul and Josanne brought us duvets just in case. So kind! Rosie, my daughter, says: "This is the best place I have EVER stayed. The pool was great and I went swimming all the time. Hank, the dog, is brilliant. He is really friendly and likes towels! I thought he might bark but he didn't. The turtles are cool too. I liked my bedroom because the bed was really comfy and I really liked the kitchen because I could watch TV after I had been swimming and mum made scrambled eggs. I want to go back again next year and every year!" I would definitely recommend staying at these apartments (we stayed in Yellow). However, if you are after an easy walk to bars, restaurants etc then you may wish to look elsewhere (but ask Paul, he can help you!). Paul and Josanne are kind, accommodating, so friendly and amusing and definitely concerned that their guests are happy. They certainly helped make our holiday wonderful! We would first of all like to thank these guests for having stayed with us and also for their lovely review. It is always our prerogative to make sure that our guests not only feel at home but also feel that they are getting the best for their money's worth. It is often the case that on arrival we make sure to send a driver to collect our guests, thus giving these the peace of mind of reaching the apartment without getting lost along the way or to having to pay for these fringe services immediately upon arrival. A quick tour of the surrounding area, especially at the Colours apartments in Madliena, helps our guests better understand where the shops, bus stops, restaurants, etc. are located (it only takes us a few extra minutes, but goes miles in our initial relationship with our new guests). Admittedly, our apartments at Colours are not 5-star, and although these still offer all the amenities that one would expect while on holiday, it is what our gardens and pool area offer that really makes this place quite unique. We will certainly have to use your description of a fairytale setting because of all the different coloured lights, our own 'blue grotto', the setting, etc. something we never really thought of, but it is very true, and we thank you for this eye-opener. We believe in renovation and change, and despite the fact that the gardens are already something out of the ordinary, we are already working on further developments for next year (where we hope that our guests will also be able to use the pool year-round .... under a retractable cover). Rosie and our other guests at the time of your stay certainly made good use of the pool, and with the weather being kind to us, the dedicated pool solar heating system did the rest to make sure that this could still be used, even at this late stage of the year (we are still trying to come to terms with how some of our guests could swim at night in late October, although we must admit, the pool is always quite inviting when lit up at night). We often have return guests staying with us, and it would be our pleasure to have these same guests returning back to Malta again in the future. Once again, a big thank you and hugs from the three of us. We had the pleasure of staying at the Colours villa, Madliena, late September / early October 2014, when we got married at the nearby Torre Paulina. In total there were 11 of us sharing, 4 couples and 3 individuals. It was nothing short of superb! The apartments provided us with all that we needed. The pool, gardens, jacuzzi and other outdoor facilities were exquisite, especially with us having exclusive use. Being able to crawl out of bed and jump into our own pool was sheer luxury! The weather was glorious. The villa is situated in a complex with other villas and is secluded, with no outside interference. You’ll need a hire car or taxis to get about, though, as the villa is located at the top of a big hill! We cannot thank the hosts, Paul and Josanne, enough! Their local knowledge, assistance and willingness to go the extra mile proved invaluable and made our stay both relaxing and very memorable; they even put out the red carpet when we got back from our wedding! Their family dog, Hank, also kept us amused. We would have no hesitation in recommending the villa. That was our first holiday in Malta, but I hope not last :) Arrived late and tired in Malta airport. Josanne (villa owner) send me instructions how to get to villa. We still manage to get lost, so she send her son to meet us. That was helpful. Villa is in a quiet area and car is essential to get to places. Nearest food shop 15 min away doh. Facilities exactly what expected. We rented yellow apartments, enough space for four adults and my 8 year old son. Two showers came very handy too. Swimming pool was bit too cold for me, but my friends had a dip on a sunny days. Garden absolutely great, a shame never had barbecue - not enough time. Oh well maybe next time :) Every time of our stay Josanne was very helpful, but not too much in your face..:) Villa is great for family or group of friends. Good for value. For couples I would look for something more luxury..
Madliena's pristine location between two valleys provides a perfect opportunity for countryside walks. This hamlet is located on one of the highest points on the island thus helping to 'cool' down the hot summer nights with its gentle breeze off the nearby coastal areas. From here one can see right across the island, all the way from Marsaxlokk, to Mdina, Valletta, and the north of the island. An important feature in Madliena are the Victoria lines where a natural fault runs roughly east to west across the island. It was the British who, by 1900 built a series of forts with intervening walls and gun emplacements along the 12km of the ridge. Because of its vantage point, Madliena was mostly used for military reasons with the most important site being the Madliena Tower. Within close vicinity, one can also find the Meditteraneo Water Park, Malta’s only marine park. This is a popular place with its many water rides, attraction pools and marine part where one can also swim with dolphins. Check-in time is after 14:00, although we will still allow you to stay by the pool and garden areas should you arrive earlier. Check-out time is 10:00; for late departures, we will normally provide you with a room where you can rest, shower and have something to eat.